Big Bad ‘Woolfe’: in for the win. Happy days and champagne at the GriN headquarters! The project we submitted for the VAF (Vlaams Audiovisueel Fonds) Gamefund was granted a “Go!”. 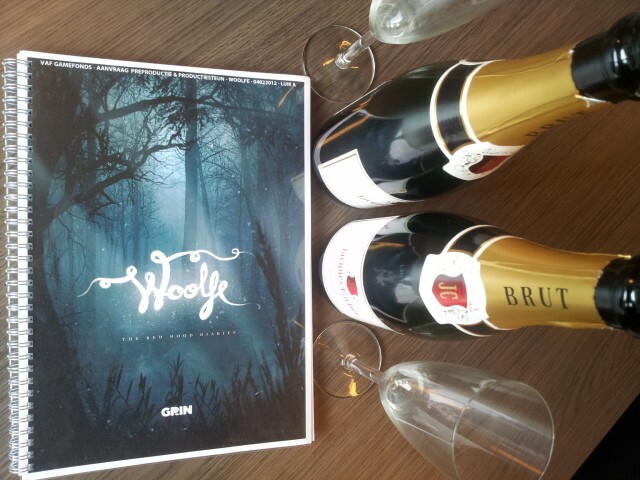 Our horror fairytale “Woolfe” was very well received by the judges, so… we popped a bottle or two to celebrate the joyful news. In this sidescroller odysee, a vengeful Little Red Riding Hood is out to defeat her greatest demon, B.B. Woolfe. Think loads of drama, visual eyecandy and dark plot twists. Got your attention? Stay tuned for more! Besides our Woolfe submission, we also teamed up with DAE Studios and director Eric Taelman for another winning project called Hill60. For this World War I game, GriN will cover the development and coding process. Last year, GriN also earned production funding for Kleuterspel / Forest pals, a series of educational games for preschoolers. This project is coming together as we speak and will be released in the fall of 2013. Have a sneak peek behind the scenes at our Facebookpage.